PRODUCT: AC FLASHING BOOT SYSTEM, 3-PIPE EPDM TOP BOOT WITH SQUARE BASE EPDM RETROFIT FLASHING BASE. FITS TWO 3/4 CONDUIT PIPES AND ONE 3/8 A/C LINE. PRICE/SET. Retrofit base flashing is split to wrap around the pipe penetration and seal base area. Square EPDM Base is 8x9 inches x 4 inches high (RF-ZPS-1EPDM). Separate top boot is solid (not split), 5 inches diameter at the base x 3 inches high. Top boot has two seals each 0.875 inside diameter and one 0.375 inch ID hole, together with 3 matching size stainless steel band clamps. The top boot fits snugly over base boot and permanently seals with M1 sealant (not supplied). 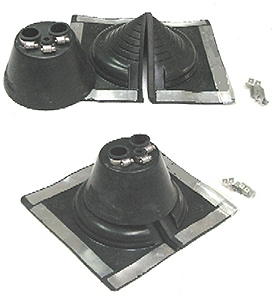 The stepped-cone base flashing design makes flashing boot easily adaptable to every roof pitch. Cut top of base flashing boot as needed to slip over all pipes. Slide over or insert pipes through. Apply M1 sealant to underside of base flange, so that 2 flashing boots are sealed together at base area. Slip pipes through TOP flashing boot. Apply M1 sealant around inside of top boot at the area it will sit on bottom flashing. OPTIONAL: apply more M1 sealant at top of pipes and around bottom perimeters of flashing boots. Side wall / wall penetrations. RETROFIT MEDIUM SIZE, ROUND BLACK EPDM PIPE FLASHING BOOT. FITS 2 INCH to 7-1/4 INCH DIAMETER ROUND PIPES. PRICE/EACH.